Synthetic peptide within Human DNAJC19 aa 62-92 (internal sequence) conjugated to Keyhole Limpet Haemocyanin (KLH). The exact sequence is proprietary. Our Abpromise guarantee covers the use of ab175611 in the following tested applications. WB 1/1000. Predicted molecular weight: 12 kDa. Probable component of the PAM complex, a complex required for the translocation of transit peptide-containing proteins from the inner membrane into the mitochondrial matrix in an ATP-dependent manner. May act as a co-chaperone that stimulate the ATP-dependent activity. 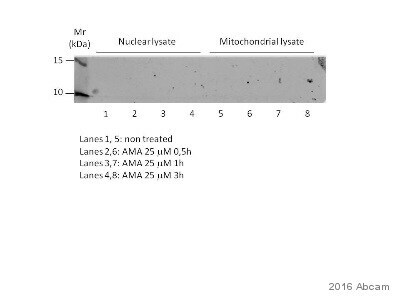 Defects in DNAJC19 are the cause of 3-methylglutaconic aciduria type 5 (MGA5) [MIM:610198]; also known as dilated cardiomyopathy with ataxia (DCMA). MGA5 is an autosomal recessive disorder characterized by early-onset dilated cardiomyopathy, growth failure, cerebellar ataxia causing significant motor delays, testicular dysgenesis, growth failure, and significant increases in urine organic acids, particularly 3-methylglutaconic acid and 3-methylglutaric acid. Belongs to the TIM14 family. ab175611 has not yet been referenced specifically in any publications. Publishing research using ab175611? Please let us know so that we can cite the reference in this datasheet.